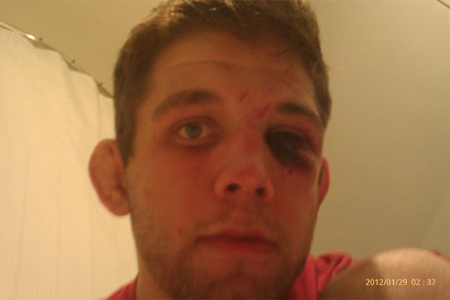 According to lightweight Nik Lentz, his left eye doesn’t hurt nearly as badly as it looks. Lentz dropped a TKO loss to Evan Dunhan on Saturday night at “UFC on FOX” after the cageside doctor erred on the side of caution and called their scrap prior to the start of the third and final round. UFC color commentator Joe Rogan suggested a broken orbital bone caused the bottom of Lentz’s eye to swell the way it did. However, Lentz states that’s not the case. Ironically, the 27-year-old claims the eye that caused the bout to get stopped is in much better shape than his broken hand that wasn’t even mention last night. Many in the media sitting in press row had awarded Lentz the opening round, while giving Dunham the middle stanza. Unfortunately for the 155-pounders, they weren’t allowed to duke it out for another five minutes to decisively determine a victor. Although Lentz collected his second consecutive loss inside the Octagon, the evening wasn’t a complete wash. He and Dunham each pocketed an extra $65,000 ‘Fight of the Night‘ bonus check for their back-and-forth battle.